There are many diseases that incapacitate patients mentally, physically and/or neurologically. Three that are often seen by physical therapists and fitness professionals working in senior living environments are Alzheimer’s, Parkinson’s and Multiple Sclerosis. Each medical condition affects individuals differently; however, there may be one common thread in terms of helping those who suffer with these diseases: Therapy and exercise in a warm-water environment. The power of water to temporarily (and sometimes permanently) restore those who have been ill has been known for centuries. In fact, plenty of people throughout time have been told to go to a “spa” (often a location with natural mineral springs and tepid pools) to cure everything from anxiety to paralysis. Though such a prescription for rehabilitation may sound antiquated, it is not. As the saying goes, “Everything old becomes new again.” What we have realized as a population is that our forbearers had the right idea. They just didn’t have the technology to truly make an impact into debilitating conditions. By making use of what we know about the scientifically-proven healing properties of water, as well as what we can do in manufacturing, we have the power to design therapy pools that can help physical therapists and fitness professionals working with seniors who have been diagnosed with Alzheimer’s, Parkinson’s and Multiple Sclerosis. Below, we’ll explore how each of these diseases affects the human body, and how therapy in a HydroWorx pool can allay some of their signs and symptoms. Although it’s a condition that is not as understood as sufferers and their loved ones would like, Alzheimer’s disease is becoming clearer year after year. Characterized by a progressive inability to remember even the simplest items (beyond that which normally occurs over time), Alzheimer’s most noticeable symptom is an unusual level of forgetfulness. The disease is the most common form of dementia, and according to the Alzheimer’s Association, it is also the sixth leading cause of death in the United States. Along with the mental impairments associated with Alzheimer’s, patients may become fearful; as they start to lose a connection with their past, present and future, they may even turn angry toward caregivers. When everyday tasks cease to be easy, the patient may lose confidence in his or her abilities; this can and often does include walking or enjoying exercise. As the disease worsens, the patient will likely have difficulty walking, too. It’s a heartbreaking condition, and there isn’t a cure. Many physicians believe that the key to longevity with Alzheimer’s is activity. Thus, if a patient with Alzheimer’s can enjoy working out in a therapy pool, whether with a clinician or as part of a larger class, that patient has a better chance of remaining in good health for as long as possible. Even if he or she fears falling when walking on land (which isn’t unusual for seniors anyway), that fear is highly negated by the natural buoyancy of the water. 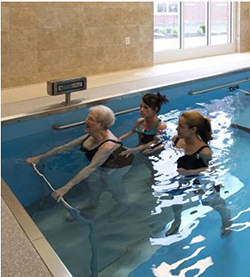 Alzheimer’s patients who have a scheduled plan for pool therapy and/or exercise may become accustomed to the routine. This, in turn, can be a boost to their mental abilities. Routine for Alzheimer’s patients may even promote slower memory loss, although this is debatable. If nothing else, it provides them with a very positive outlet. The therapy pool has a psychological effect on those with Alzheimer’s by the warmth of the water. Not only is it soothing to the body, but it can be soothing to the mind. Many Alzheimer’s patients live with a high degree of uncertainty and stress because they know something is wrong, but aren’t sure what that is. If pool therapy can alleviate those tensions, the patients will be under far less emotional turmoil throughout the day. Like Alzheimer’s, Parkinson’s disease tends to be progressive in nature. (In fact, it is rated the second most common neurological disease affecting adults in America after Alzheimer’s.) Disturbing the neurons in the brain, Parkinson’s slowly robs patients of balance, muscle control and motor functions. As has been noted by the Parkinson’s Center for Disease, there is a two to four percent increased risk for Parkinson’s disease among people over the age of 60. Therefore, senior living facilities often have a large number of people in various stages of the disease. Although no one is quite certain why Parkinson’s occurs, genetic links are suspected. Other factors that can lead to the condition appear to be repeated head trauma, and long-term exposure to environmentally-hazardous materials like pesticides, heavy metals and cleaning solvents. If patients with Parkinson’s live long enough, they may reach the point where they are bedridden or wheelchair-bound. To combat the symptoms of Parkinson’s without adding more pharmaceuticals to a patient’s treatment, numerous physical therapists and exercise experts are introducing seniors with the disease to water-based exercises and rehabilitation plans. In a HydroWorx pool with variable-depth floor, a patient who cannot safely move freely on land can enjoy some independence, security and control in the pool. Best of all, regular exercise provides improved balance, delayed progression and improved dopamine release/uptake. In terms of the water’s temperature, the thermal effect of a HydroWorx therapy pool plays a crucial role when working with a population of seniors with Parkinson’s. Because the water is warm, patients exhibit less shivering, more body control, less rigidity and reduced pain. In a nutshell, when patients exercise in therapy pools of around 90–92 degrees Fahrenheit, the experience is overwhelmingly pleasurable. Consequently, individuals with Parkinson’s tend to continue with their HydroWorx warm water therapy pool regimens, and are reportedly more satisfied with the quality of their lives as a direct result. Multiple Sclerosis is a condition that weakens muscles and movements over time. Thus, strength training early and often is one of the key ways to keeping the muscles from weakening. However, this can be understandably difficult for someone who has difficulty walking, picking up a fork to eat or simply waving hello. For Multiple Sclerosis sufferers, the HydroWorx therapy pool can be a place for them to more easily build lean muscle mass than would ever be possible on land. Even if they cannot walk down the street comfortably or safely, they can walk on a treadmill in the water without fear. Not only are they protected by the innate buoyancy of the water, but they are given a psychological boost because they aren’t afraid to fall. In a case study that was recently done in Great Britain, a woman with Multiple Sclerosis was treated in the HydroWorx pool. She had complained of progressive weakness in her upper and lower left limbs during a (roughly) two-year period. She had to walk with a cane, and tended to favor one of her legs over the other. This was causing serious gait problems. For the woman, improved mobility was a goal of her water-based rehabilitation. In conjunction with limited land-based activities, the HydroWorx underwater treadmill was used for gait re-education and related exercises. Her physiotherapist planned a treatment schedule that included backward and forward walking, as well as squatting. An underwater video camera provided instant biofeedback as her therapy progressed, and adjustments could be made in the moment. Over a three-week period, she was constantly measured to pinpoint whether or not the pool therapy was working. At the end of her treatment, she was able to stand and function more symmetrically on land, which reduced her need to rely on any kind of assisted devices. When looking at the advances this woman made after only 21 days, it’s exciting to think about what could potentially happen at a senior living facility where dozens of patients with Multiple Sclerosis could come together and work as a team to improve their strength, strides and overall wellbeing. There is little doubt that it could create an enormously positive atmosphere at the facility among the patients, their caregivers and their families. One recent case illustrating the power of water to combat problems related to major conditions involves a 67-year-old patient diagnosed with both Multiple Sclerosis and Parkinson’s who sought treatment at a senior living campus. The woman, Virginia, has been wheelchair bound due to her illnesses, but was particularly concerned because her body had begun to lean to the left to the point where she could not easily read the newspaper, play the piano or easily put on her slacks. Virginia was determined not to allow her conditions to stop her from having a good quality of life. Therefore, she turned to water therapy twice a week. When she began her rehabilitation, it was very difficult for her to bear any weight until she was significantly submerged and the buoyancy could prevent her from falling. After three months, she improved her core strength to the point where she could sit and stand upright, and could exercise in water depths that were lower than before. As Virginia’s physical therapist now notes, she has improved to the point where she can stand against currents created by resistance jets. Additionally, her posture is much better. Most exciting of all from Virginia’s perspective was when she had a check-up with her neurologist who was amazed at the results. Now, Virginia plays the piano for up to 45 minutes at a time without leaning to the left, and can feel the positive effects of being stronger and more stable. The topic of healthcare for people of all ages, not merely seniors, is an important one. It’s consistently making headlines, especially with the Baby Boomer population reaching retirement age. Knowing that hundreds of thousands of seniors are going to be diagnosed with Alzheimer’s, Parkinson’s and Multiple Sclerosis each year, senior living facilities with the means to invest in a warm-water pool with integrated treadmill technology would be wise to do so. By keeping their population of patients as active as possible through water-based therapies and exercise options, a facility could make great advances in the field. Though none of the aforementioned conditions that have been covered has a cure, they can all be managed through a combination of prescription drugs, diet and exercise. HydroWorx therapy pools might just wind up being the deciding factor for someone looking for a long-term place to stay during their later decades.